Mapping a research area and getting high resolution aerial photos has become a whole lot easier for the University of Maine at Presque Isle’s Geographic Information Systems [GIS] Laboratory thanks to a brand new remote sensing tool—the DJI Phantom-4 drone. 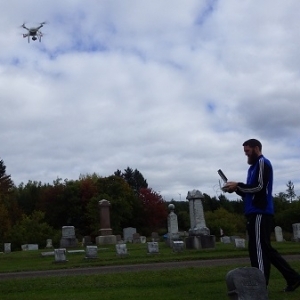 UMPI’s GIS Laboratory is the first among all GIS laboratories at universities and colleges in Maine to acquire unmanned aerial vehicles (UAVs) and use them in geospatial applications. Dr. Chunzeng Wang, UMPI Professor of Geology, GIS, and Environmental Science, and UMPI GIS student Andrew Dolley have been using the new technology this semester for a community service project in Mars Hill—taking aerial photos of Kings Grove Cemetery in order to create a cemetery plot map for the Mars Hill Town Office. They also recently used the drone to obtain very high-resolution aerial photos for Mantle Lake Park and UMPI cross-country trail mapping projects. The aerial photos will be used to develop the base maps for the projects. UMPI’s GIS Laboratory started this project in Fall 2014 at the request of Mars Hill Town Manager David Cyr. Two students from Dr. Wang’s GIS II class, Seth Cote and Riley Hutchinson, used on-site Trimble GPS mapping methods and an on-screen digitizing method (tracing on a satellite image) to map part of the cemetery. 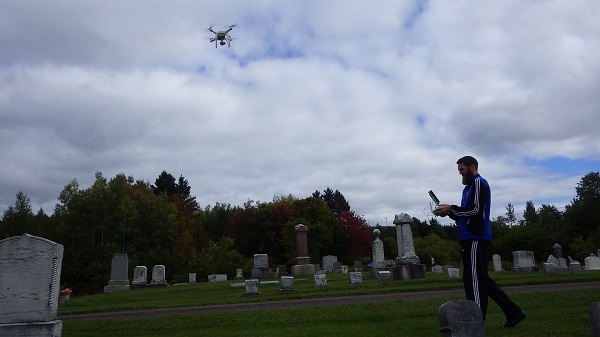 With the application of drone technology during this fall’s mapping work, Dr. Wang said the cemetery mapping project will be easier, faster, and more accurate. GIS is an advanced mapping technology that is used for both precision and accuracy. GIS has the ability to combine useful data to make a single map. GPS, which stands for Global Positioning System, is a satellite-based navigation system that can be used to calculate a precise location anywhere in the world. The DJI Phantom was one of the new pieces of equipment the GIS Lab was able to purchase following the STEM (Science, Technology, Engineering, and Mathematics) bond approved by Maine voters in 2013. With this funding, the GIS Lab also received a considerable hardware and software upgrade. In total, the lab was able to add two new DJI-Phantom-4 UAVs. Dr. Wang explained that these small, ultra-light weight, and smart UAVs are a game changer in terms of how GIS professionals collect data and conduct mapping. Previously, the primary method for collecting GIS data was to use remote sensing technology such as satellites and manned aircrafts carrying sensors and cameras. However, the highest possible resolution of remote sensing data, such as aerial images, that GIS users normally can access is about a 30 to 100 centimeter pixel size. In addition to recreational photographing from the air, sophisticated or GPS-enabled UAVs have many specific uses. For example, according to Dr. Wang, because photos taken by drones contain GPS information, image processing software can stitch a number of photos together, called a photo mosaic, to make a geo-referenced base map for any mapping purposes. Photos also can be used to create a point cloud and a digital surface model (DSM) for featuring 3D visualizations, terrain modeling, and spatial analysis. Other uses include archaeological site mapping, geological applications, environmental monitoring, crop management, and forestry management and planning, among others. UMPI’s GIS program emphasizes hand-on learning and real-world applications of geospatial technologies. Every year, a number of students taking GIS courses work on various community projects by applying all means of geospatial technologies. For example, in the summer and fall of 2016, students mapped: manholes and water valves for the Presque Isle Utilities District, hiking trails in Mantle Lake Park in a collaboration with ACAP and the Presque Isle Recreation and Parks Department, ATV trails in southern and northern Aroostook County in a collaboration with several local ATV clubs, and cross-country trails on the UMPI campus. Several students in Dr. Wang’s Fall 2016 GIS II class have begun learning how to fly the new drones. Dolley who takes GIS II and also works as Dr. Wang’s project assistant, took more than 120 photos in late September at the Kings Grove Cemetery with the DJI Phantom-4 drone and is working on the photos to make a cemetery plot map. Once it is completed, the Town of Mars Hill will use the highly accurate map to manage its cemetery. To learn more about UMPI’s GIS Lab and the community projects it does, please contact Dr. Wang at chunzeng.wang@maine.edu or 207-768-9412.